Setting clear expectations with a strong-willed child can be challenging. When they’re young, they have big tantrums that parents often want to avoid. This desire to avoid tantrums creates a pattern of parents giving in to appease the tantrum rather than remaining firm and implementing the clear, strong limit the child needs. The following real life coaching scenario from June of 2016 involves a dad, Ben, learning how to set limits and boundaries with his strong-willed nine-year-old daughter, Julia. In the email exchange below, Ben shared his success and then asked me for additional advice. While he did an excellent job setting his personal boundaries and limits for his daughter, Ben did not establish the emotional connection that would lead to future improved cooperation. Oftentimes, parents become concerned that if they are compassionate with their kids, they won’t be able to hold the boundary or limit. To address this concern, I recommend practicing firmness and compassion together, which leads to incredibly positive results. Below is Ben’s email with my coaching suggestions added in bold. I have indicated whether each of his statements was a boundary or a limit. All names have been changed for confidentiality purposes. I would like to relay an example of an interaction I had with Julia this past weekend. I welcome your input! On Saturday, my wife left early in the morning to go to a training session for Girl Scouts. I asked a babysitter (Mary) to come to our house to help with the kids since there were a couple of activities going on that morning. The plan was to pick up Tommy from a birthday party at 11:30 in San Mateo and then drive to Goodwill to drop off a carload of donated items. After that, we were planning to go to the county fair, which Julia was looking forward to. The Goodwill donation was from the Girl Scouts. My wife had left instructions that Julia needed to make a sign saying, ‘Gift from Girl Scouts Troop ******,’ and wear her sash while holding the sign in front of Goodwill. Julia refused to make the sign. I simply said, ‘Sign and sash and then we leave.’ (Limit implied in an After – Then Strategy) I needed to make a phone call, so I went downstairs for about 20 minutes. When I came back up, she had made the sign but had not gotten her sash. Julia refused to look for the sash. She got in the car and said, ‘I won’t wear the sash. It doesn’t matter. Let’s just go.’ I reiterated, ‘When you bring your sash, then we can leave’ (After – Then Directive) but she refused to get out of the car to get the sash. We were running late, and we needed to pick up Tommy at 11:30 exactly. Fortunately, the sitter (Mary) was there. So in light of Julia’s refusal, I asked Mary to pick up Tommy. It took a lot of focus to stay calm and not threaten Julia. (Congratulations on your self-control, Ben! At this point, since Tommy was being picked up, here is where you could have taken the opportunity to connect emotionally with Julia by using empathy. For example, ‘I can see that you definitely don’t want to wear your sash. I’m wondering why you’re so resistant.’ Then PAUSE and give her space to share her reasons and feelings. We devised a plan for Julia to use the sign she had made to cover up the incorrect troop number on her sash. We got in the car, met up with Mary and Tommy, and then proceeded to Goodwill. When we arrived, Julia initially refused to put on her sash. I calmly (Fantastic!) explained that the sash was part of her commitment to her troop. (Limit) She put it on, I took a photo, and we left in pretty good shape. Great implementation of the skills you’re learning! I suggest that you study more of Section 4 in your binder on communication blocks, listening openly, and empathetic statements to build more competence with these skills. Along with boundaries, is the importance of everyone in the family stating their appreciation to each other. Read how…. 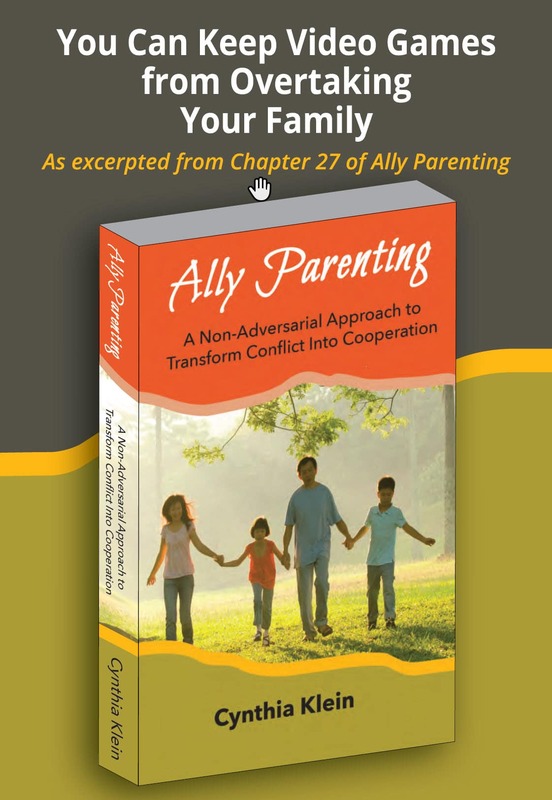 ©2016 Cynthia Klein, Bridges 2 Understanding, has been a Family Success Coach since 1994. She works with parents and organizations who want more cooperation, mutual respect and understanding between adults and children. Cynthia presents her expertise through speaking and private parenting coaching sessions. She writes the Middle School Mom column for the Parenting on the Peninsula magazine. She works with parents of 4 – 25 year-old children.